Mexican gold bullion coins distinctly stand out among other popular gold bullion coins due to their unique beauty and exceptional heavy weight compared to other gold bullion for sale coins. If you consider lower premium costs per spot price of gold for Mexican gold bullion coins, they make not only a superb gold investment but also a highly desirable addition to any fine numismatic collection. The most distinct and well recognized among Mexican gold bullion coins is a 50 pesos Mexican gold bullion coin that is also referred to as Centenario. The Mexican Centenario weighs in at impressive 37.5 grams of gold and contains 90% gold to 10% copper alloy for extreme durability. These Mexican gold bullion coins were initially minted in 1921 to celebrate the 100th Anniversary of Mexican Independence from Spain. Mexican Centenarios are struck with an image of Winged Victory set at the backdrop of famous Mexican volcanoes; the reverse side is decorated with Mexico’s official Coat of Arms image. Excellent Mexican gold coins value allow you to capitalize on lower dealer premiums compared to other famous American, Canadian or European gold bullion coins and create an impressive gold investment portfolio. However, it’s worth mentioning that if you decide to purchase Mexican gold coins of older mintage years like 1921 or 1931 Centenarios, you should expect to pay slightly more for their historical significance factor. Mexican Libertads gold or silver coins are also an excellent collector or investor choice and are usually referred to more modern Mexican bullion coins. 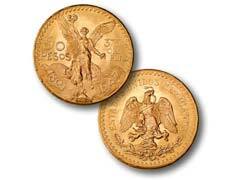 Gold Libertads are considered modern remakes of more historical Centenario coins and come in uncirculated and proof like varieties. The face design of these coins also features a Winged Victory with volcanoes background but set somewhat at a different angle. Mexican gold bullion coins have been gaining popularity in the light of recent worlds’ economic crises allowing gold investors to get the most gold for their hard earned money and create a recession proof investment portfolio.